A message of hope, love and courage. Purchase a book here and have your copy personalized by the author. please click here to send us a message through the contact form and we will get in touch with you regarding shipping charges. Darkening my very heart, and causing me great pain. 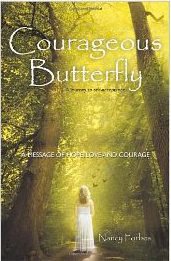 Courageous Butterfly is a spiritual journey of a brave young woman, who had suffered from a deep loss, and extreme loneliness. Her true story is entertaining, inspiring and enlightening. Most of her life she fought, resisted and struggled. At the age of thirty-seven, she hit rock bottom, leaving her no choice but to get up and try to stand tall. She questioned, explored, and searched for freedom and peace. In the quiet of her soul, she heard whispers, guiding her into a spiritual awakening. At first the gentle voice said, "I love you. I'll take you on a journey that will change you forever." The Whispers of Heaven led her back to her heart, God. Together they worked on healing her broken heart and destructive behavior. Nancy's message and intentions are obvious, she now wants to share her healing with the world, hoping to make a difference in someone else's life.